Here at Suburban Lots Inc. we are a professional land seller. 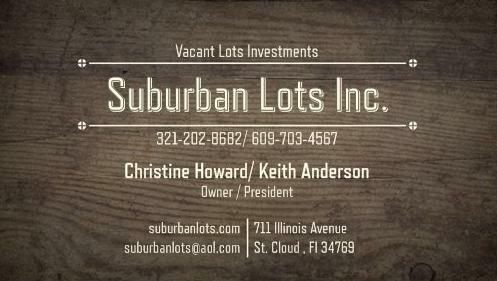 We are located in the Saint Cloud area of Osceola County were the lots are located. We are out at Suburban Estates enjoying the land every weekend and during the week. We cater our service to the lot buyer. We use contracts on all our lots so you have it in writing what you are buying. We will meet you at the Courthouse to record the deed and hand you a key to the lot. We have in stock dry affordable lots that will get you a gate key access all year long. These are the minimum size wet lots that allow you to become a landowner to gain access to Suburban Estates, Holopaw, Saint Cloud, Florida. Price $3,500.00 includes the key, special warranty deed and recording costs. If you are interested in selling your lot, contact Suburban Lots Inc. with your parcel # and tell us how much $$ you want for your property. Suburban Lots Inc Buys and Sells Land in Suburban Estates where SEPA Club Inc is located. SEPA Club Inc does not sell land. Properties are for sale by owner. We are not a real estate agent. This does not constitute an offer where prohibited by law.